This report includes a situation update submitted to KHRG in July 2012 by a community member describing events occurring in Nyaunglebin District between January and June 2012. Specifically discussed are Tatmadaw demands, including new gold mining taxes imposed by Light Infantry Battalion #264 and their demands for sentries, and the construction of a bridge inside Na Tha Kway village, which has displaced many villagers without providing compensation. 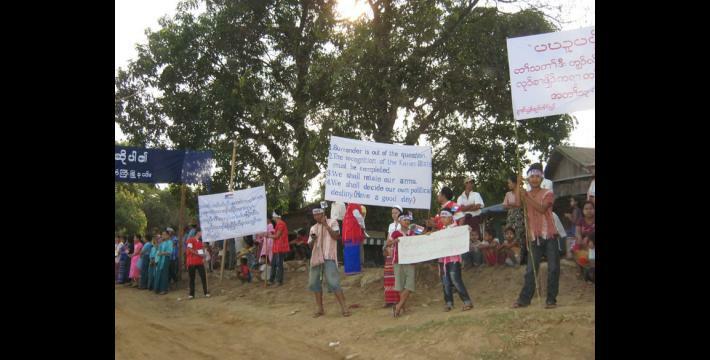 This report also includes information about 400 villagers who gathered together on March 12th to protest the construction of Kyauk N'Ga Dam on the Shwegyin River in Hsaw Htee and Ler Doh townships; the opening of a Karen Nation Union (KNU) liaison office in Ler Doh town on April 9th, during which over 10,000 villagers awaited government officials; the arrival of representatives from the Norwegian government to the internally displaced persons (IDP) area in Mu The; and a visit by a United States Senator on May 29th in Ler Doh town and subsequently in Nay Pyi Daw. The report also describes work and food security problems in Nyaunglebin, where some villagers have migrated to neighbouring Thailand and Malaysia for employment, or to work in Yangon's growing entertainment industry. The community member spoke with villagers in the area who expressed overall satisfaction with the peace and ceasefire process, and they hope that it will continue to be stable. The following situation update was written by a community member in Nyaunglebin District who has been trained by KHRG to monitor human rights conditions. It is presented below translated exactly as originally written, save for minor edits for clarity and security. This report was received along with other information from Nyaunglebin District, including six interviews, one other situation update, 277 photographs and 36 video clips. There are a lot of human rights abuses in our area. Villagers who are in flat areas and mountain areas have to deal with food and work difficulties. 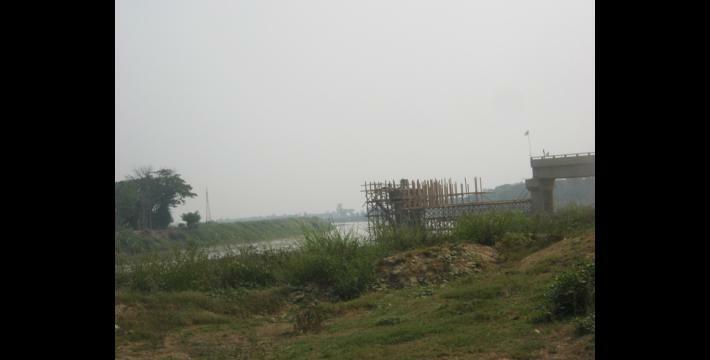 On March 12th 2012, the villagers protested the Kyauk N'Ga Dam on the Shwegyin River, in Leh Hta Kwee. 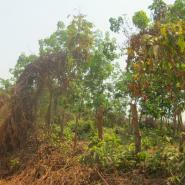 Rich people bought land from the government and planted rubber plantations, which caused problems for the resident people. • "No continuation of the dam construction"
• "Compensation for losing lands"
• "Let the water flow naturally"
The villagers made these requests but there was no response from the government until now. They behaved like nothing concerned them. In Ler Doh and Hsaw Htee townships, wealthy people purchased land from the government and planted rubber plantations, but some haven not been planted yet, as the KNU protected the land. However, the wealthy people took some land from a forest reserve; some are from places where residents farm hill fields and search for firewood. Some are people's farms, but since the government does not recognize [the land] as farms, they registered them as uncultivated land and sold them to wealthy people. One person who bought land is U Nyan Shwe Win. [He bought] 7,000 acres of land between Ler Doh and Leh Weh Hkee (Kyauk Ken Gyi). U Nyan Shwe Win bought another 2,000 acres beside Ler Doh. Major Than Tay bought 3,000 acres between Baw K'Hta and Ler Doh. U Aung Thin Myint bought 3,000 acres in Baw K'Hta area. The Win Company bought 3,000 acres in Baw K'Hta area. 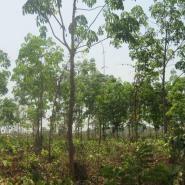 U Soe Soe Lwin bought 3,000 acres in Baw K'Hta area. 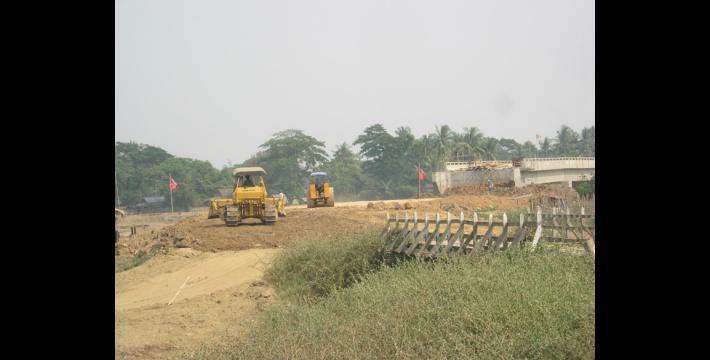 U Htin Kyaw bought 7,000 acres between Shwegyin and Baw K'Hta. U Pyit Soe bought 9,000 acres in Doh Hsee Kway Hsa. Daw Yin Mya Soe bought 5,000 acres between Doh Hsee and Shwegyin. 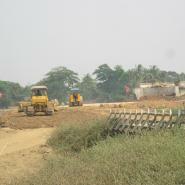 Moe Aung bought 3,000 acres beside Shwegyin. 37,000 acres were bought from the government. There are still many whom I cannot get their names. 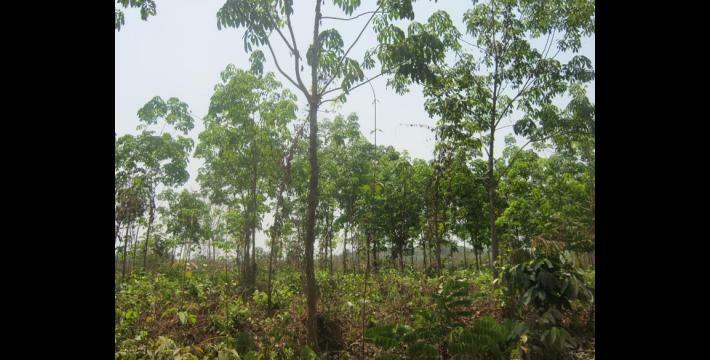 Beginning in 2000, the government worked on the Sittaung River Valley project in order to establish rubber, jatropha and agarwood plantations. Of the people who took the land, some have already planted, but some have not started planting yet. This causes problems for the residents, because the government sold the land. Villagers who stay in that area cannot work because those areas have their [new] owner. They mostly go to work in other countries, such as Thailand and Malaysia. Just in this year , 40% of the people went to work in another country. Beginning in 2012, LIB #264, which is based at Baw K'Hta army camp, has demanded money from people who mine gold. 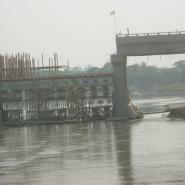 Beginning in 2012, they demand 50,000 kyat (US $57.14) for each gold sluice, every month. There are over 30 gold sluices in Ler Doh Township, Than Kyo Wein area; they are only small gold sluices for providing daily livelihood. 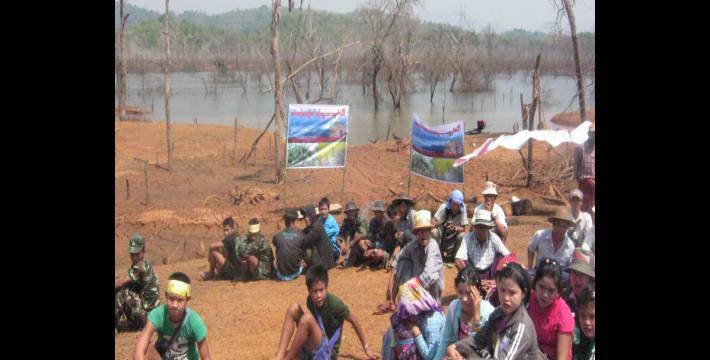 The government army [Tatmadaw] LIB #264 demanded [the tax] from people who mine gold and they [villagers] could not pay them, so they [LIB #264 soldiers] went and demanded [payment] at their place [mine]. The LIB #264 demand is just to abuse the villagers. In the past, people who strongly demanded money were the police, but now the government army [Tatmadaw] is worse than the police. Those demands have become ordinary for the villagers. In Kyo Gyi army camp, they [LIB #264] met with village heads and forced villagers to be sentries. 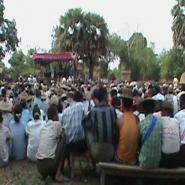 If the villagers do not want to be a sentry, each person will have to pay 2,000 kyat (US $2.29) each day. Two people must be sentries every day. The villagers have to go every day, as now is a busy time of year. Mostly, the villagers hire people, because now is a busy time of year. 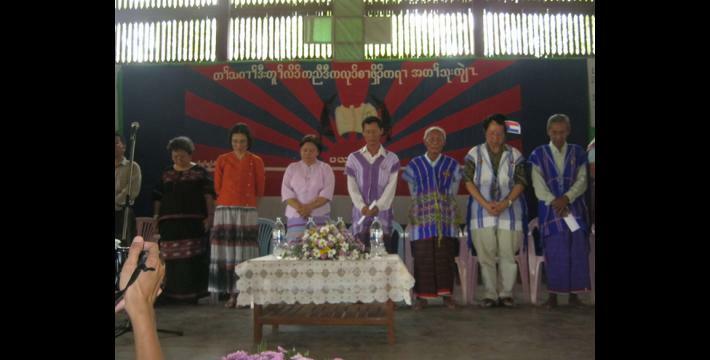 Nine people, including a KNU secretary and representatives, came to Ler Doh and opened a KNU liaison office in Ler Doh town on April 9th 2012. The KNU and the government leader, U Aung Min, came and opened a temporary KNU liaison office inside the USDP [Union Solidarity and Development Party] office. 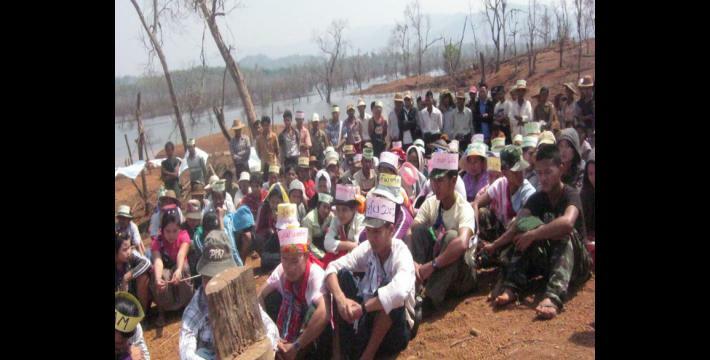 The villagers awaited the KNU and the government leaders to come, this time, with willingness and need for real democracy. The villagers waited for the leader's representatives along the way from Na Tha Kway to Ler Doh; there were over ten thousand people. In the past, battles always occurred in the area and the villagers were always depressed. 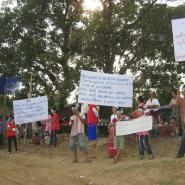 So, the villagers need freedom, and they reported their needs and opinions for the opening of the liaison office to the leaders from both sides, advocating for a real need for democracy. While the villagers waited for the leaders from both sides, they made a sign that said: "We pray to be liberated from battles in Ler Doh area". The villagers' sign showed their real need and desire to be liberated from fighting, pressure and conflict. The leaders from both sides will arrange and settle the conflict to create real democracy that will be stable forever. 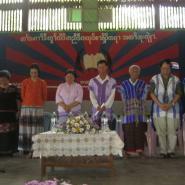 As soon as the KNU secretary and leaders finished opening the liaison office, they visited villagers in Kaw Hsaw Htee Church. They held a public conference and talked about the KNU and the government process for peace, and explained [the details to] the villagers. On May 16th 2012, Mr. Petrie and four friends came to Ler Doh and went to IDP areas to see the villagers' situation.On April 9th 2012, the Norwegian representative, Mr. Charles Petrie, came to Ler Doh and went to Mu Theh to view the IDP [internally displaced persons] area. 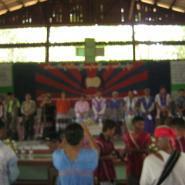 After reaching Mu Theh, he met with some of the Burmese leaders and KNU leaders. After they finished the meeting, they went to the IDP areas in Kheh Der village tract, questioned T'Kaw Der villagers and slept at T'Kaw Der village. 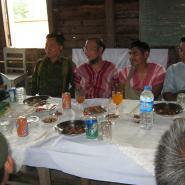 On April 18th 2012, he went back to Mu Theh village and met with the government army leader and KNU leaders. Mr. Petrie stated that the villagers need real peace and democracy: "Because of conflicts, the villagers are really in trouble and need support to build their houses [and] work places. So, I will report to Norwegian leaders about the villagers' situation and needs, and I will help the villagers". On May 28th 2012, the Norwegian Deputy Foreign Affairs Minister, the Norwegian Ambassador to Thailand, Cambodia and Burma, and many representatives came to Ler Doh. 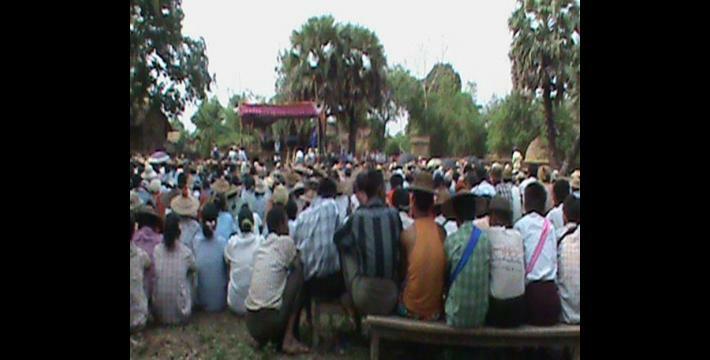 The government leader General Kin Yin and KNU leader Major Htoo Htoo Lay came and managed the meeting with the IDPs in Kheh Der village tract. Thirty representatives for the villagers came to the meeting in the KNU liaison office in Ler Doh. 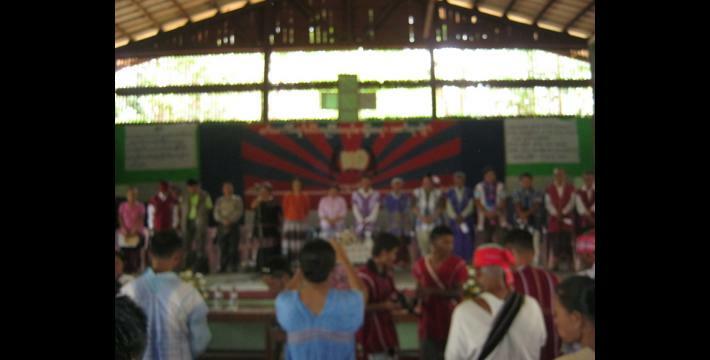 During the visit, Norwegian leaders, the government leaders and the KNU leaders were talking a lot. 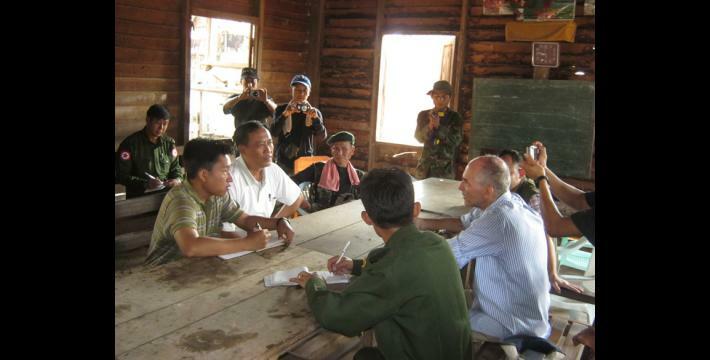 General Kin Yin gave temporary ID cards to the 30 representatives of the villagers in IDP Kheh Der village tract. Norwegian deputy foreign affairs minister said, "I will support the villagers and I have already prepared $5,000,000 for the IDP's to rebuild their lives. Norway representative, Mr. Charles Petrie, takes responsibility for the Norwegian support. CIDKP takes responsibility for working with the villages' Human Right Committee in the IDP areas." 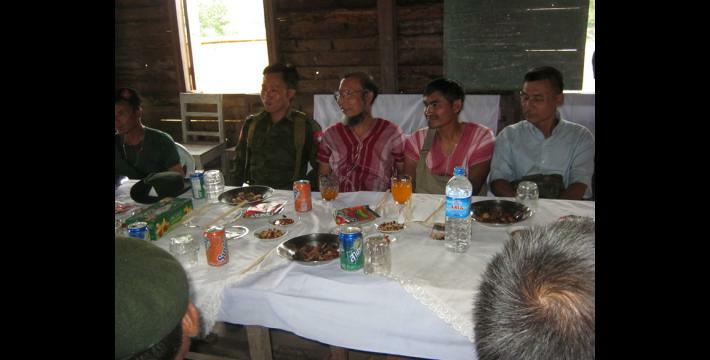 On May 29th 2012, American Senate Finance Committee [member], US Ambassador and Doctor Samantha came to Ler Doh, Sa Phyu Gone and met with religious leaders, KNU leaders from the 3rd Brigade, and CIDKP leaders. They discussed the peace process and IDP villagers. They discussed this for one hour, and two of the American representatives went to Nay Pyi Daw. 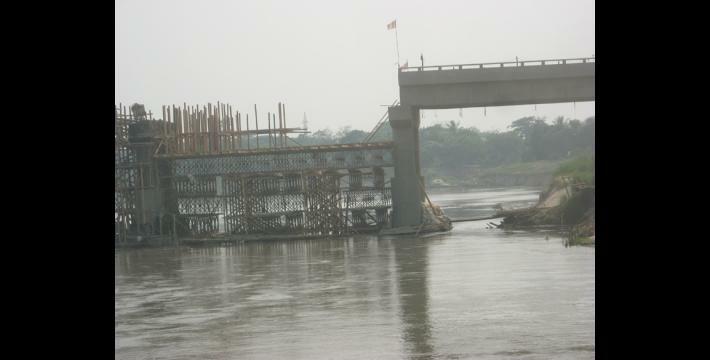 The American representatives arrived [in Nay Pyi Daw] and did not inform the Burmese leaders, so the Burmese leader in Ler Doh and Bago Division said that the arrival of the foreign people was illegal: "In the future, if the foreign people come, they can travel only until the west [side] of Pgeh Loh River [Sittaung River], they cannot come to the east of [Sittaung River]". The Burmese leader defended this [position]. They [the government] said they will build up democracy in Burma, but the foreign leaders did not inform them, so it became a complaint from the Burmese leaders. 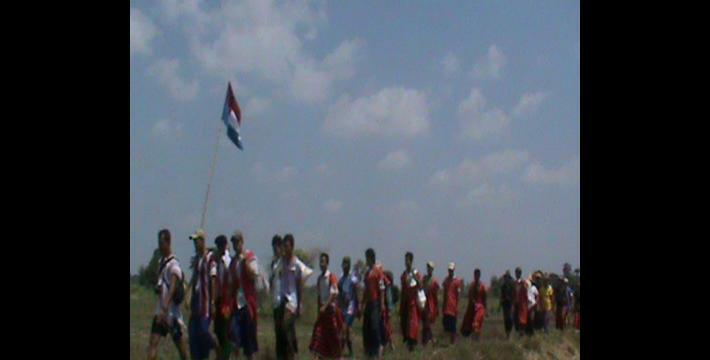 On May 1st 2012, KNU 3rd Brigade held a public conference related to the KNU and the government meeting on the peace process, such as: the KNU requested 11 points [for peace], but the second time, the KNU requested 13 points and then had a meeting with the government. They received responses to all of their 13 points. 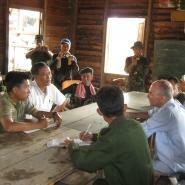 KNU 3rd Brigade met with villagers and explained the peace process and that peace will be stable. Villagers should be involved in the process, with both sides of the government. The KNU, 3rd Brigade, began explaining to the villagers about the peace process from Moo Township, Ler Doh Township to Hsaw Htee Township. 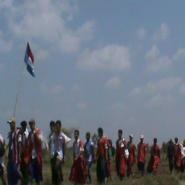 The KNU 3rd Brigade leaders who went to meet the villagers did not wear soldiers' uniforms and did not bring weapons. They wore Karen traditional shirts and went to one village after another, and a group of villagers travelled with them to one village after another village. There were 15 leaders of the KNU 3rd Brigade who were travelling, and there would be over one hundred people, including villagers, who went with them. 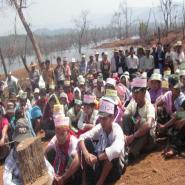 The villagers got an opportunity to report and talk about their opinions and ideas in all meetings. In the meeting in Da La Say village tract, Thay Plaw Tah village, the village head reported that: "Because of the battles over 60 years, the villagers are getting poorer and have become refugees. A lot of people have to go and be slaves in other countries, so we need lasting peace for our new generation in the future. Currently, there is [only a] ceasefire and our villagers do not feel there is enough peace, so we hope to gain lasting peace in our country." Villagers in our area have to deal with food problems. In the mountains, they do hill field [farming] and corn plantations, but insects eat [crops] so they do not get enough food and face food problems. On the plains, they do flat field farming, but because of flooding, their paddy died so they have to deal with food problems. Their paddy died, so then they planted beans, but insects ate the bean and killed them, so it caused extreme problems for them. For the villagers to farm plantations and plant paddy, the government loaned money, but the villagers' beans and paddy died, so it caused problems for them to pay back the government loan. People who have farms and buffaloes sold their farm animals or property, and then they paid back their government [loan]. The villagers are farmers. Their paddy and beans died and [they] have a lot of debts. They do not have other work to do in the area, and they cannot work so they have to go to work in Rangoon, Thailand and Malaysia. In this year , there might be [as much as] 20% of young people in our area who go to work in other countries. In our country, there are a lot of civilians becoming unemployed and going to work in other countries, also [others who] cannot go as they do not have travelling costs. Working in Burma, the salary is not much for work, so it is hard to support their family. In our country, there are a lot of civilians becoming unemployed and going to work in other countries, also [others who] cannot go as they do not have travelling costs. Working in Burma, the salary is not much for work, so it is hard to support their family. Nowadays, in Rangoon, Karen girls and other ethnic girls sell their bodies in many ways to be able to support their families. There are a lot of Karaoke shops in Rangoon and the ethnic girls have to entertain visitors who come, and prostitute their body in many ways. The Karaoke shops are called KTP and a lot of them have opened. The shops are illegal. The shopkeepers do not work and arrange secretly with local authorities, such as police and other powerful groups. Most people who go to the shops are police, Burmese leaders, rich people and people who take bribes. It is depressing for our Karen girls and other ethnic girls. In Kyauk Ta Kah Township, Taw Kweh Aye area, the villagers face problems and poverty. They have to sell their body. This happens because the country's politics are not stable and the civilians have to face problems and poverty. 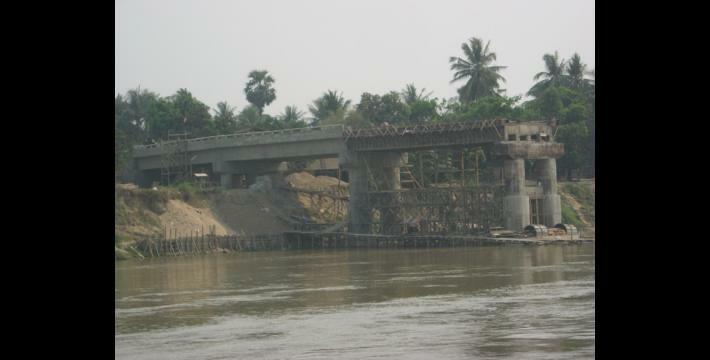 The Burmese government built a bridge on the Sittaung River in Na Tha Kway area, and there are 11 households in Na Tha Kway that had to move. 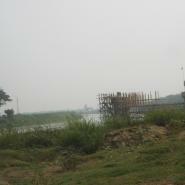 The houses relocated but the government did not give any compensation. 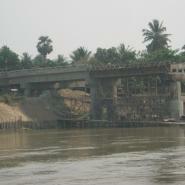 The bridge did not replace the old bridge; they build it in the village and it crosses villagers' house gardens. 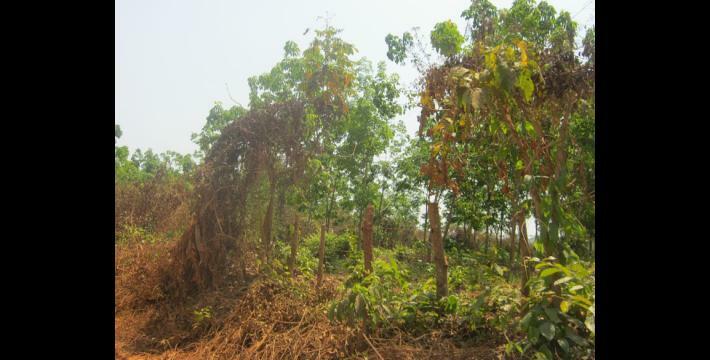 The government did not give any compensation for villagers who had to move or villagers who lost their gardens, so it caused difficulties for the villagers. In our area, the Burmese army does not have any activities; they only walk on vehicle roads and send [supplies to] each other. There are no army activities on the plains or the mountains. They stay in their camps and sometimes send [supplies to] each other. They do not demand any forced labour. If they need something, they do it themselves and do not order the villagers [to do it]. 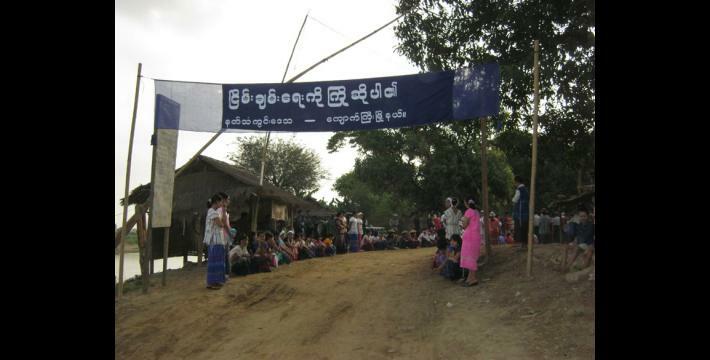 They keep a militia in Na Tha Kway, Kyauk S'Yee and Ler Doh towns. The government does not provide the militia's salary, so the villagers have to provide [it] every month. The village head collects money from the villagers; the villagers have to pay 1,000 kyat (US $1.14) per house every month. The villagers want to remove the militia but the government does not remove [it] for them. They are forced to keep it [militia] until now. 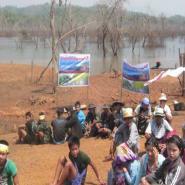 In our area, because the KNU and the government held peace [talks], the situation for the villagers has become better. The villagers travel to work freely without questions. 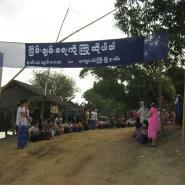 The sustained ceasefire makes villagers feel the [presence of] peace and are happy to travel to work freely. In the past, there were battles and the villagers could not work freely; they had to [obtain] written work permission. Because of the pressure of battles, the villagers have gotten poorer. Now, the villagers have to rebuild their lives from the beginning. In the mountains, Norway is supporting pilot projects, so it makes the villagers happy. In our area, the villagers really need support. To rebuild their life, they [villagers] organise a group called a Human Rights Committee, and if support from other countries arrives, and if it is helpful for them, they will accept it. The things that the villagers need most are enough food, security, and to work undisturbed. In our country, villagers need peace and unity, and to continue for the new generation in the future. The above information is the true thing that has occurred in our area. We write the above information as we see and know. In order to increase the transparency of KHRG methodology and more directly communicate the experiences and perspectives of villagers in eastern Burma, KHRG aims to make all field information received available on the KHRG website once it has been processed and translated, subject only to security considerations. As companion to this, a redesigned website will be released in 2012. In the meantime, KHRG's most recently-published field information from Nyaunglebin District can be found in the report, "Sustained Tatmadaw resupply operations in Thaton, Nyaunglebin and Papun during ceasefire," KHRG, May 2012. In this context, "people," includes both individuals as well as corporations who possess the financial backing to undertake the respective project. This statistic is the community member's estimation based on personal experiences in the community. As of August 22, 2012, all conversion estimates for the Kyat in this report are based on the official market rate of 875 kyat to US $1. This reflects new measures taken by Burma's central bank on April 2nd 2012 to initiate a managed float of the Kyat, thus replacing the previous fixed rate of 6.5 kyat to US $1. A sluice is a construction for channeling water to wash and separate gold from silt. It is likely that the community member was referring to Susan Collins, a US senator who visited Burma during this period. Senator Collins is not, however, a member of the Senate Finance Committee. See "President U Thein Sein receives US Senator Hon Susan M. Collins and Party," New Light of Myanmar, May 30th 2012; see also "Sen. Susan Collins visits Thailand, Myanmar; to meet with Aung San Suu Kyi," The Bangor Daily News, May 29, 2012. Although the community member uses the term "ambassador," there technically was no US ambassador appointed at this time. It is likely that the community member meant Foreign Service Officer Michael Thurston, who attended these meetings, but his position at that time was what is called a Chargés d' Affaires, which is an alternative to ambassadors that nations have used throughout history. See "President U Thein Sein receives US Senator Hon Susan M. Collins and Party," New Light of Myanmar, May 30th 2012. 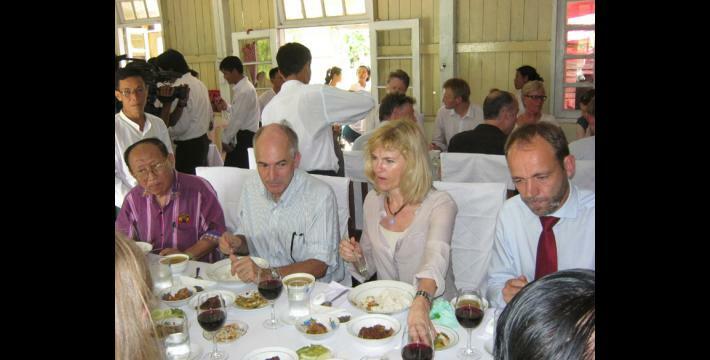 On July 11th 2012, Derek Mitchell became the first US Ambassador to arrive in Burma since September 30, 1990.